When you live in California, having a little bit of moisture build-up is inevitable. Although that is the case, one of the first things that you should be aware of is that water build-up will also attract specific pests to your home. Given that this is a state with so much moisture, it’s always good to know what types of pests this moisture could be attracting so that you can catch any infestation problems in advance. 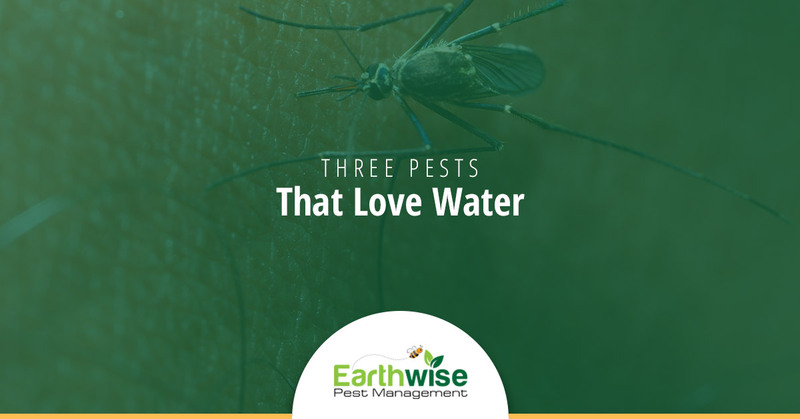 In our blog post today, we are going to touch on a few of the pests that you should keep an eye out for when it comes to bodies of water and generally moist areas. Let’s dive in. A pest that is commonly associated with moisture and water will be the mosquito. In warmer states like California, mosquitos are extremely common. This is both because of the warm temperatures that provide them with a longer life cycle and the humid habitat that welcomes them with the water that they also need to survive. Having water buildup is an even bigger problem when you’re living in warm states where moisture is always a factor of the living condition. Mosquitoes are known for flying around bodies of water, and that is because they require this little bit of moisture to reproduce. It’s in the bodies of standing water that mosquitoes are able to lay their eggs. If you have any standing water around your home, there are a few things that you need to be concerned with. For starters, mosquitoes are transmitters of many diseases. When you have those stagnant bodies of water and multiple mosquitoes that are using it as a life source, you do have to be worried about any diseased mosquitoes coming to that body of water and spreading it. For that reason, it’s essential that you are cautious of stagnant bodies of water and whether or not they are creating a mosquito infestation. The pest that everyone is scared of finding in their house: the cockroach. The unfortunate news is that these are the second pest that we’re going to touch on today. Cockroaches are known for hiding in dark places and for being drawn to areas that provide them with the moisture that they need. For that reason, it’s not uncommon that cockroaches are found underneath kitchen and bathroom sinks. Aside from this being a dark space that also provides them with that extra moisture, it’s these types of spaces that also yield food sources for these particular pests. Of course, the best thing that you can do is make sure that all food sources in the kitchen area are sealed off so that you don’t have to worry about cockroaches getting into them. But, you should also make sure to check for all leaky sinks and moist areas that also offer a dark space. The unfortunate thing about cockroaches is that if you’ve seen one cockroach, the chances are high that there are more. As soon as you notice one cockroach you should contact your local pest control company so that they can take care of the problem as quickly as possible. As if cockroaches weren’t a daunting pest to come across, the last pest that we’re going to touch on today is one that people genuinely do not want to find in or around their home. Termites have caused more damage to structures than most natural disasters are responsible for. These pests are known for creating colonies in moist structures, and once a colony is formed, you will quickly see why this is one of the worst infestations to have. When looking for ways to reduce the chances of an infestation, the best thing that you can do is minimize the moisture in the structure. Aside from that, it’s best to keep an eye out on all trees outside and surrounding your house. The sooner that you catch a termite problem, the less damage you’ll have to account for. If you have any bodies of water and are noticing that insects are swarming around them, it’s time to call a professional. These are the situations that lead to infestations. Earthwise Pest Management responsibly removes pests by looking at the components that are attracting pests in the first place. Contact our pest control company today to see how we could be assistance to you and your Sacramento home.